edited 2017-10-15 at 2:11 a.m.
Say you want to create a ground plane that can be scaled to any size and maintain the same texture size on the surface without having to change the material tiling every time. Since this is not default functionality or some setting you can turn on, how can this be accomplished? I had this exact same question about a year ago when messing with Unity. DaveA answered a bit vaguely and re-reading his answer now, I implemented exactly what he suggested. You can see how to create both ideas he suggested in this article. There are two methods to achieve texture tiling based on size. 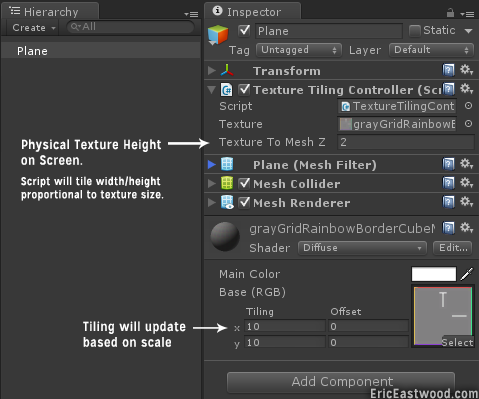 The first way is adjusting actual texture tiling property whenever a change is detected in scale. The second option is to procedurally generate a plane mesh with many segments all with overlapping UVs. I recommend this approach because it doesn't waste memory and resources on a bunch of vertices like method #2 requires. We will be monitoring Transform.lossyScale for changes because it is the world scale, and we only care about the plane's actual size which includes any parents scaling. Once we detect a change, update Material.mainTextureScale to the appropriate tiling for that new size. Another point of interest is the [ExecuteInEditMode] attribute which will make the script run in the editor even without playing. 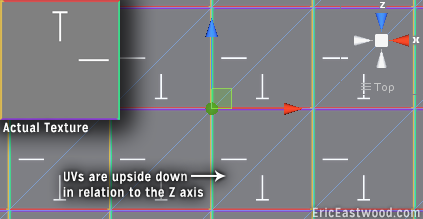 Note: Unity's default Plane primitive seems to have its UVs upside down. You can model your own 10mx10m, 10x10 segment plane in a 3D program(Blender, C4D, 3ds max). Or you can use this procedural plane script which is available in my project Radius, on GitHub. Make each pair of triangles that make up one rectangle overlap in the UV map. This means you will have 6 vertices for every iteration of the tiling. I do not recommend this for large ground planes. 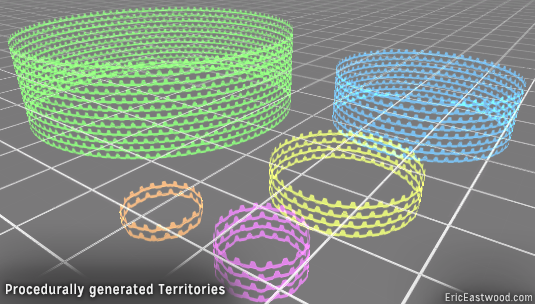 Note: Unity has a 65k(65,534) vertice limit for a single mesh. I use this same technique for making any sized territory in Radius. Drag ProceduralPlane.cs and GroundController.cs onto an empty gameobject. To adjust the plane size, edit the Width and Height properties of GroundController.cs. Fill in the references for Procedural Plane and Texture. 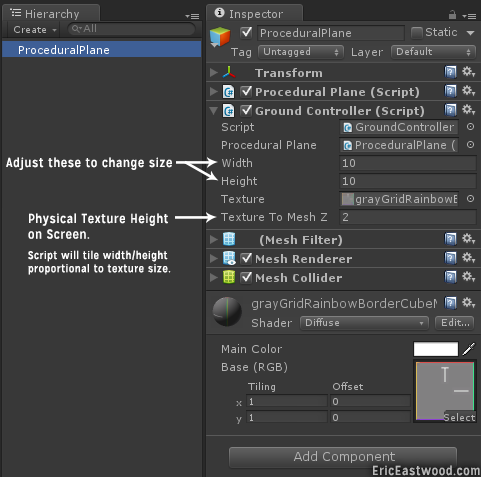 Drag the object with script in the hierarchy tab onto the Procedural Plane field. Drag the texture you are going to tile from the Project tab onto the Texture field. You can get the procedural plane script in my project Radius, on GitHub. Requires: MeshUtils.cs also available in Radius. // This will not be the same as the collider height.